NASA on Thursday outlined the many challenges that remain before humans can set foot on Mars, calling the problems "solvable" but setting no firm date for an astronaut mission to the Red Planet. Updated details of the US space agency's Mars strategy were contained in a 36-page document released to the public ahead of upcoming talks with Congress about budgets for space exploration and a major international meeting of the space industry to be held in Jerusalem next week. The United States is "closer to sending American astronauts to Mars than at any point in our history," said NASA administrator Charles Bolden. "In the coming weeks, I look forward to continuing to discuss the details of our plan with members of Congress, as well as our commercial and our international partners, many of whom will be attending the International Astronautical Congress next week," he said in a statement. Astronauts who journey to Mars could spend three years in deep space, where radiation is high and so are the risks of cancer, bone loss and immune problems, said the document, called "NASA's Journey to Mars: Pioneering Next Steps in Space Exploration." "Living and working in space require accepting risk, and the journey is worth the risk," it said, calling Mars "an achievable goal" and "the next tangible frontier for expanding human presence." The plan ahead is divided into three stages, the first of which is already under way with testing and experiments on human health and behavior, life support systems like growing food and recycling water, and 3-D printing aboard the International Space Station. The second phase, called "Proving Ground," begins in 2018 with the launch of the new deep space capsule Orion and the most powerful rocket ever built, known as the Space Launch System, or SLS. The space agency plans to practice other missions in the area of space between the Earth and Moon, or in the Moon's orbit, known as cislunar space. These include sending a robotic spacecraft in 2020 to lasso a boulder from a near-Earth asteroid and ferry it to an area in deep space that astronauts can investigate. "NASA will learn to conduct complex operations in a deep space environment that allows crews to return to Earth in a matter of days," said the report. "Primarily operating in cislunar space, NASA will advance and validate capabilities required for human exploration of Mars." The third phase involves living and working on Mars' surface and in transiting spaceships "that support human life for years, with only routine maintenance," as well as "harvesting Martian resources to create fuel, water, oxygen, and building materials." NASA gave no precise dates for this phase in the report, though one graphic mentioned "human missions to Mars vicinity in 2030+." As NASA presses further into space, the agency acknowledged that the problems will grow more complex. "Future missions will face increasingly difficult challenges associated with transportation, working in space, and staying healthy," said the report. NASA also said it needs to develop adequate space suits for deep space exploration, and must test advanced solar electric propulsion to power spacecraft efficiently. "NASA will have to learn new ways of operating in space," said the report. "Crews must be protected from the unique hazardous environments of deep space and on the Martian surface. Often, systems will have to operate autonomously or remain dormant for years in preparation for crew," it said. 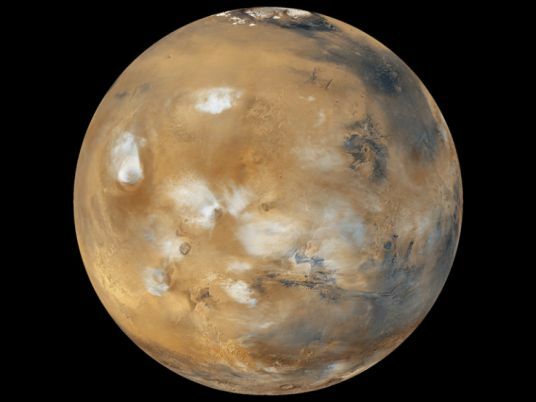 "Overcoming these challenges will be essential on the journey to Mars." Before humans ever set foot there, the US space agency and global partners plan a series of new robotic rovers, adding to those already sent by NASA, including the Curiosity rover which touched down in 2012. Even that rover's spectacular sky-crane powered landing must be completely revamped for a human-scale landing, which would be 20-30 times heavier. A vehicle to lift humans from the surface of Mars into Mars' orbit is also needed, and is considered "critical to crew survival." NASA said "the most important challenge for human pioneering missions is keeping the crew safe for long-duration missions up to 1,100 days."